On the day that Chancellor Merkel anoounced a need for “radical” changes in the automotive industry towards BEV and FCEV, pointing to Germany’s 1.2 bln support fro a Battery production Alliance, a 40 GW electrolyzer alliance pushed its way to the Public Forum of the Fuel Cel and Hydorgen Group Exhibit at the Hannover Fair. A few months ago EHA sat with Dutch” hydrogen professor” Ad van Wijk to discuss a hydrogen equivalent to EU commission 20 GW Battery Alliance. EHA suggested that an electrolyzer intiative should at least double this figure to attract attention. A quick round of calls of the professor to electrolyzer manufactures and renewable experts confirmed that 40GW of electrolyzer installations by 2030 in Europe should be possible. The idea was quickly picked up by the German Hydrogen and Feul Cell association DWV and Hydrogen Europe and the 40GW Hydrogen Alliance was born. At the Hydrogen and Fuel Cells Europe Public forum on day 2 Siemens and ITM Power confirmed that these figures are technical feasible. ITM Power dounbled in size and is locating to a semi automated production facility. BP indicated that by law oil companies need to blend in biofuels but that this was not sufficient to fulfill the EU requirements. Europe has an excess renewable storage need of 50TWh;in Saxony 70TWh is available in storage capacity. Recently a cluster of 19 companies, of which Gasunie, Shell, Groningen Seaports, Nouryon, Engie, Eneco en Provincie Groningen in the North of the Netherlands publsihed their investment agenda of 2.8 bln to create large scale green hydrogen demand of which 600 mln should be public funding. 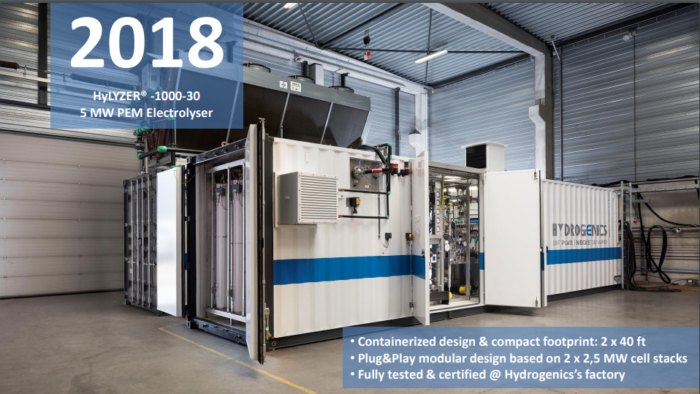 The traditional electrolyzer pitches on Day 2 included news from Hydrogenics on the outlien of a 100 MW plant; 5 MW fits into two 44 ft contriner (sse phote, courtesy Hydrogenics. Hydrogenics recently announced an order from Air Liquide Canada to design, build and install a 20 megawatt electrolyzer system for a hydrogen production facility located in Canada. The facility is expected to be in commercial operation by the end of 2020, with an output of just under 3,000 tons of hydrogen annually. The 20MW plant will use Hydrogenics’ advanced large-scale PEM electrolysis technology. NEL called for action to just start larger electrlyzer integration in ammonia production facilities as one ammonia plant would already need the total ammount of annual sales of electrolyzers in 2017, 100MW. EHA picked up on promotion of methanol of Palcan referring to the 4000 taxies and large methanol network. the maritime interest of PowerCell, a fast running Swedish fuel cell stack maker in cooperation with Siemens. The meetings with new start ups always light up any day of the fair: Dutch HyMatters is looking to suport the integration of fuel cel and hydrogen systems at local level: their links with the Hydrogen H(2) igher Instute (Hoge School) of Arnhem ensures expert advice on how to build local hydrogen communities.